Today's Photo Hunt theme is bags and today is Halloween, so what better to share than a paper bag to fill up with Temptations and something to play with after it's emptied. Mom's hamburger was in the bag, but after she finished with it, she gave it to me. Hurry up, Mom! Fill it up with Temptations! I hope everyone has a great Halloween. Be careful with all of those little beans coming to your front door. Look at the special Halloween present I received from Isis, Summer, Babe, Jeannie, Bob and Romeo from Peggy's Place. It's a Catnip Candy Corn! I just love catnip! But at my age, I get a quick buzz and then I fall asleep. Look how big my nip candy corn is! I also received a Halloween card from Laila and Minchie, but mom hasn't had the chance to take a picture of it yet. They were my Secret Santas last year and are very special to me. Speaking of Christmas, if you would like to exchange Christmas Cards this year, please email me before Thanksgiving. We need to mail my cards early this year because mom's shoulder surgery is the week after Thanksgiving. Is it my turn to . . . Mom just doesn't get it! Toesie Tuesday is for us kitties. I think she is still upset with the little furball that this big furball left her yesterday morning and she stepped in it with her toesies while it was still wet and warm. Hee! Hee! I think it's still funny. Mom, just what do you have hidden under there? Mom spent over 8 hours on the computer working on a project that was due today. As you can see, I was patiently (for a few minutes) waiting for her to pay attention to me. She didn't finish the project until 2:00 am, so I didn't get much attention yesterday. I left her a surprise on her bedroom floor! Pee ess - She stepped in it with her bare foot this morning! Hee! Hee! I think I better take advantage of the sunshine while I still can. We change the clocks next weekend and the days will start getting shorter. Have a wonderful Sunday, my furriends! Good morning! I think I need to put on my peppermint shoes today. For those of you who don't understand what I mean - I put my paws in my mouth yesterday and the peppermint shoes will make them taste better. I think I may have offended some of my floofy friends yesterday. 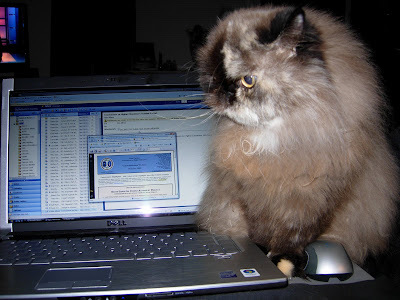 What I meant to say was that I was introducing my Himmie, Persian, and Birman friends from around the world. All of my furriends on the CB are special, whether they are smooth and silky, or floofy. I have bunches of furriends from the Floof and Fur Gang who are extra floofy. Am I forgiven? Nom! Nom! 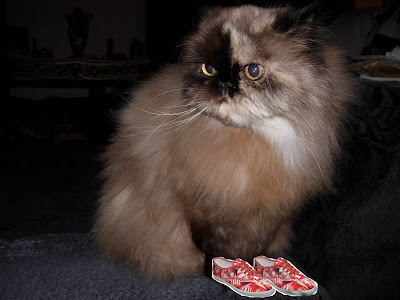 These peppermint shoes sure taste good! I thankful for chin scritches and belly rubs from my Mom! Mom Paula: I'm so thankful for Sweet Praline and the calming effect she has on an otherwise hectic life. Her belly is so soft! Today is the day to show your "tocks" in honor of Derby's birthday. Mom has been following me around the house all week trying to get a good picture of my tocks. The picture below is a side view of my floofy tocks. MOOOOOOMMMMMM! Don't show that rear view of my tocks!!! Luckily, I have a lot of floof to cover my private parts. A ladycat isn't supposed to show her rear end. Praline - Just wait until I get the flashy box and get a picture of your tocks Mom! Mom has been really busy at work again. So much so that she is working at home when she should be taking care of me. Do you think if I sit by her laptop looking cute that I can get her to pay attention to me instead of work? She says she is trying to get stuff caught up before her shoulder surgery. I feel for her, but I'm the princess around here and all of her time should be spent pampering me. Don't you agree? Have an Easy Sunday today! I'm taking advantage of the cool fall weather and sleeping in most of the day. Mom! Do you realize it's only a little over 2 months before Santy Paws will come to visit us? I thought of a great way to raise extra green papers. I can sell belly rubs and snorgles for $5.00 each. We could make a fortune! What do you mean the Great Pawmpkin must come first?!? He doesn't bring me presents! Ooooohhhhh! He brings you chocolate! You've got to have green papers for that too, don't you? Am I floofy enough for you today? Did you get your floof fix? Mom is trying to catch a good belly pose for you, but my eyes haven't been cooperating (the laser eye thing). Have a great weekend. Today is my 502nd post! I can't believe I reached the 500 milestone and Mom didn't help me post about it! I think I need to advertise for a new secretary and get someone I can depend on. I'm even late getting my post up this morning because Mom fell asleep on the couch again last night with the laptop in her lap! 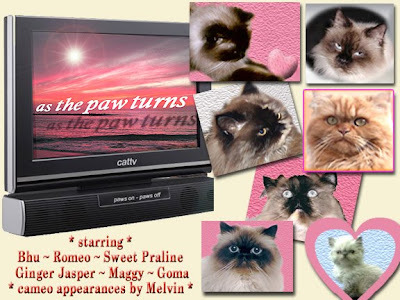 I think one of the most memorable posts of the 500 posts is the AS THE PAW TURNS series. That was fun and a lot of my floofy (flat-faced) friends were involved. We simply must do that again. I think PAWS of OUR LIVES may be on the horizon . . . I don't think that's what they mean by "toesie" Tuesday, Mom! Look Mom! I've got a "royal" package from my beau, Ginger Jasper! Hurry up! Help me open it. Isn't this mousie cute? Come on, who's cuter? The mousie or my flat face? Jasper sent me some special treats from England. I've never had these before, but they sure are good. Nom! Nom! Thank you very much, Ginger Jasper. You and your mom are very special for remembering me on my birthday. 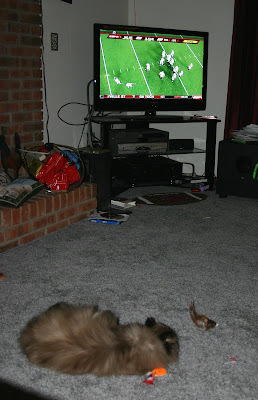 Watched a lot of college football on TV yesterday, so I'm tired! I think I'll take it easy today. What, Mom? There's pro football on today!?! Wake me when it's over! Mom and I love to watch sports on TV, especially college football. When mom isn't actually at the South Carolina Gamecock stadium watching games in person, we're watching football on TV. 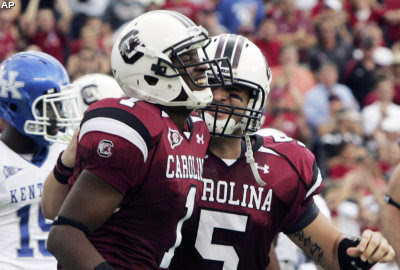 Mom's chickens (Gamecocks) are playing the Kentucky Wildcats today. Even though I should pull for the Wildcats because they are kitties, I must pull for Mom's chickens! 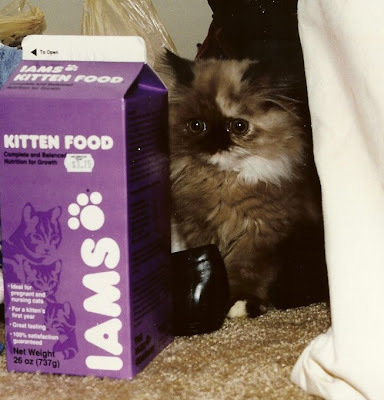 Mom was up late last night working on a presentation for a meeting today, so I decided to post a Baby Praline picture for Floofy Friday. These always make mom smile! I'm thankful for my furriends, old and new, on the CB. They have reached out to me when I was sick and to my mom during her surgery and illnesses. I've received special packages through Paw It Forward, Secret Paws, Christmas in July, and for my birthday. There are others who will send a surprise just to let me know they are thinking about me. Even though I enjoy the presents, it's the kind words, comments, purrs, purrayers, and thoughts that mean the most. I know it is supposed to be better to give than to receive, so my gift to everyone is sharing my life with you through my blog. If I've brought a smile, a tear, a laugh, or an awwwwww, then it's worth it all! I hope all of you have a wonderful day and have plenty to be thankful for! Pee ess - I received a birthday present from my boyfriend, Ginger Jasper. I'll share pictures in a couple of days (mom is really busy at work this week). I think I must have scared my mom sick on Sunday because she woke up Monday not feeling well and she stayed home with me all day sleeping. I don't think she is mad at me anymore for sliping out the front door. I received lots of hugs today. I received two packages on my birthday from Billie and Laila & Minchie. The packages arrived on my birthday, but I've just had the chance to share with you. Billie's mom made a beautiful handmade card of me. This is so special because Mom Lorianna has so much pain in her hands. 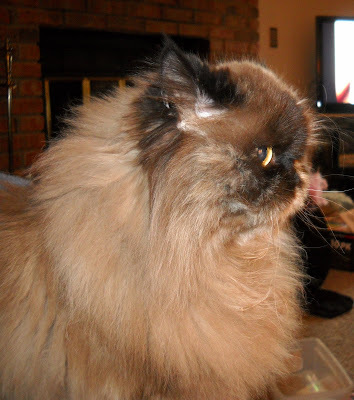 She also sent me a Fancy Feast Appetizer and some Friskee Hairball treats (which I love). Mom even got some Reeses White Chocolate Peanut Butter Cups, which are her favorite. Biggify the picture below and you can see how much I love my appetizer and treats. Laila and Minchie sent me a special card and some fun mice to play with. I love my furriends and their moms. Thank you so much! Why, you say? 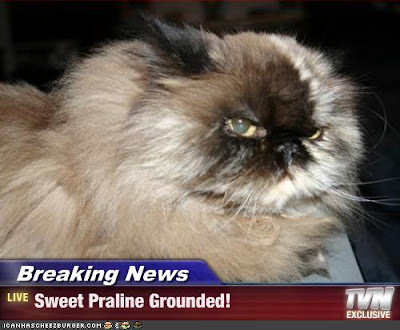 Why would I, Sweet Praline be grounded? I plead temporary insanity! The evening was cool and Mom was talking to a friend on the front porch with the door open and I walked right outside to join her. Mom's friend just said, "Don't let Praline get out" and my mom responded, "She won't come out" and she looked down beside her and there I was. You should have seen mom move! I didn't think she had it in her to move that fast! The last time I tried this trick was about 8 years ago! Mom has the eagle eye on me now! I think I'll hangout in the bathroom for a while until Mom calms down. Pee ess - My friends, Samantha and Mr. Tigger are missing. Please go over and send some special purrs. MOM! This is not the best angle for a photo. You're making my behind look big and I am NOT fat, I'm FLOOFY! Mom Paula: Oh Praline - just hush and let's have a relaxing Sunday! Today's Photo Hunters theme is Words. Mom found this cool program on the Internet that turned my picture into words. 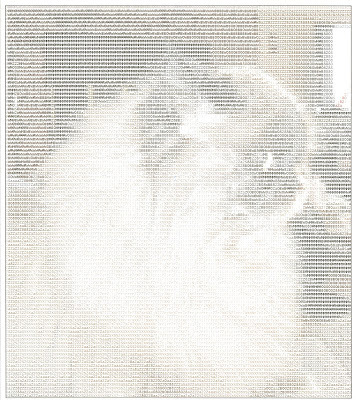 I hope you can biggify it to see the letters, but I think this is just the coolest thing! I hope everyone has a wonderful Saturday! It's been a little cooler in South Carolina this week, especially at night! However, Mom says it is definitely not time for a fire, no matter how cute I look! But I do have my wood ready! Mom says I've got to get a lot floofier before a fire is built. How much more floofy can a ladycat get? Mom! I think my floof needs to be brushed! I can't let all of my furriends see my floof so tousled today!